These two signs are just wrong. The first one, men working overhead, hang on – no women working here? 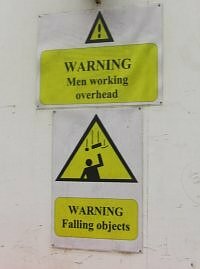 The second one, falling objects, is not a good health and safety notice – doesn’t exactly inspire confidence!